At first, Shanghai can feel overwhelming. Uprooting and travelling over multiple time zones is a strain on the constitution. To have to then navigate a gigantic, crowded and confusing city in a foreign language is altogether exhausting. We help you to travel around Shanghai on public transport with our helpful guide. Most international flights arrive at shiny new Pudong International Airport (PVG), located 30 km (18 miles) outside the city proper. A taxi to downtown Shanghai will cost about RMB 180 and take 45-60 minutes. Ignore the touts: they will charge you three times the rate. Alternatively, the lightning-fast German-engineered Maglev train connects the airport with Longyang Lu Metro Station in Pudong. The 21 km (12 mile) journey only takes seven minutes, but on arrival you are still a 30-minute taxi or Metro ride from downtown Shanghai – and this is inconvenient with heavy luggage. Maglev tickets cost RMB 50. See www.shairport.com for more information. For the first few weeks – even months – it’s a good idea to carry a street and Metro map around. Shanghai is not a grid, and the sporadic maze of alleys, streets, boulevards and freeways is difficult to navigate, even for the city’s seasoned veterans. Morning and evening rush-hour traffic is characterised by dense, aggressive traffic and frequent gridlock. To avoid culture shock in Shanghai, we recommend using all the public transport available to you before you use a private driver in China. Despite the massive size of greater Shanghai, most of the central areas are grouped together and manageable in size. Once inside a neighbourhood, getting around on foot is relatively easy. Central Shanghai is surrounded by one principal ring road, Zhongshan Lu, which links Puxi to Pudong via the Nanpu Bridge. The city is bisected by Yan’an Lu, an elevated freeway lit at night by red and blue neon. The elevated freeway dividing the city up and down is Gonghe Xin Lu / Chongqing Nan Lu. The most important ground level streets are Huaihai Lu and Nanjing Lu, which are both major shopping streets. Fuxing Lu, which is parallel to these, cuts through the heart of Puxi and leads into the Fuxing Tunnel that runs under the Huangpu River into the financial district of Lujiazui in Pudong. All street signs are written in both Chinese and pinyin (phonetically romanised Chinese). The range of street numbers on each block is also posted on the street signs. Taxis are generally a cheap and efficient way to get around Shanghai, traffic permitting. There are approximately 45,000 taxis in operation in the city, belonging to seven privately owned companies. It’s easy to flag one down on most busy streets – unless it’s raining, in which case be prepared to wait for the weather to clear, or head to the nearest Metro stop. Most of the drivers are native Shanghainese and know the city well, although being as specific as possible with directions will speed up your journey and make it cheaper. Taxi fares start at RMB 14 for the first two kilometres, RMB 2.4 for each additional kilometre. Tipping is not expected, but welcomed nonetheless. Cash or stored valued cards (see jiaotong ka, below) are accepted as payment. Most drivers speak limited or no English, so you should be able to show them your destination in Chinese. The driver will supply you with a receipt (fapiao), which shows the taxi number and the company telephone number – very useful information if you leave something in the cab. If you have a mobile phone, you can take advantage of the DiDiDaChe service to book taxis during peak hours - you will need to speak Chinese though. Uber is an international upmarket taxi service that now provides a service in Shanghai. Cars are of a higher quality, and by using the Uber app, you can see if there are cars available nearby and then track the car’s progress to meet you once you have booked it. (www.uber.com) The only hitch is that you require a Chinese credit card to use the service. This is the fastest way to travel across the city. Trains are almost always on time and at busy stations in the central areas arrive every three to five minutes. This is generally a nice way to travel. The trains are clean, quiet and safe. Tickets cost RMB3-7, or alternatively you can purchase a stored value card (jiaotong ka) from one of the booths. They’re valid for the Metro, buses, taxis and ferries and can be purchased at any Metro station for RMB25 which is refundable when the card is returned. If you buy a single journey ticket at one of the automated machines, hold on to it. You need it to pass through the exit gate. As opposed to buses, signs and maps are clear and in English, making the train system easy to navigate. On the down side, crowds are usually dense during the daily rush hours of 7:30-10am and 5-7:30pm. There are currently 14 Metro lines, however the city is constructing additional Metro lines and stops at a furious pace, with the aim of having 75 percent of Shanghai residents living within 600 metres of a stop. You can view the most up to date metro map here. 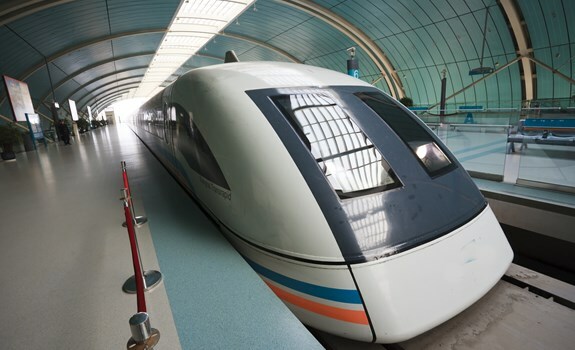 Opened on January 1, 2004, the Shanghai Maglev is the first commercial maglev in the world and offers a very fast and convenient way to travel between Pudong International Airport and Pudong. The 30 km distance is covered in 7 minutes and 20 seconds, reaching a maximum speed of 268 mph. There are well over 1,000 bus routes, taking you to every corner of Shanghai, operated by a variety of private companies. The rides are cheap. Direct journeys, which can be purchased in cash from the driver, cost about RMB 2. However, prepare to hit a major language and navigation barrier. Unlike in the Metro, maps are not easy to read and do not provide an English translation. The buses are often crowded and struggle through traffic during rush hour. Chinese speakers can contact the Shanghai Urban Transportation Bureau (6317 6355) for route and time information. On the whole, this is not a recommended mode of transportation for a newcomer. Even though cars are ubiqitous, bikes have seen a revival in recent years. Dedicated cycle lanes have always been part of the roads and drivers are fairly cautious around cyclists. You can pick up a relatively inexpensive bike for around 300RMB, and old Shanghai model for around 500RMB or a snazzy fixed-gear bike for around 1000RMB. Cycling at Chinese New Year and October National Holiday are a pleasure with the roads being free of traffic. Walking is a great way to get around central neighbourhoods in Puxi. The sidewalks in the former French Concession districts of Xuhui and Luwan, the old city area of Yu Yuan, and the area around People’s Square are particularly good places for walking, with restaurants, shops and housing all situated next to one another. Sidewalks are wide and well-maintained, making for pleasant strolls that will give you a chance to take in the rich and dynamic urban environment. Take great care when crossing the street, however, as vehicles are permitted to make right turns at stop lights, and Chinese drivers almost never respect the rights of pedestrians. During rush hour, cyclists and scooters will use sidewalks to bypass gridlocked intersections.